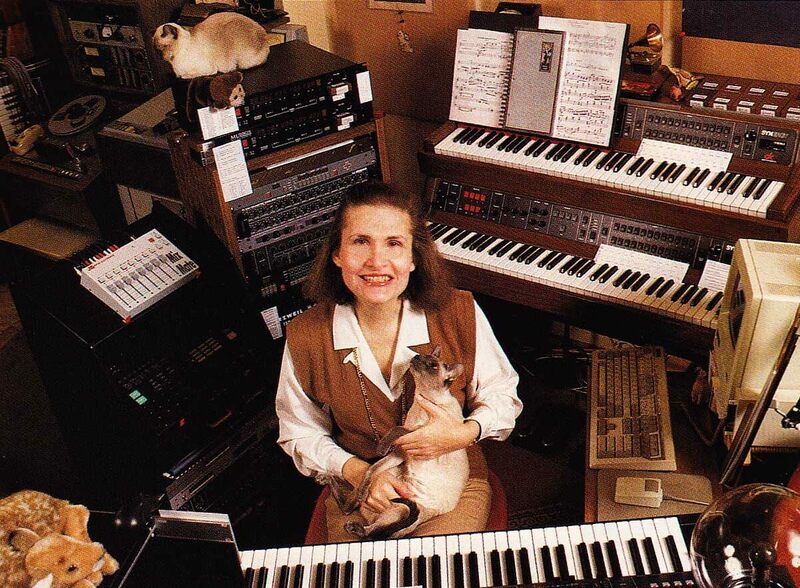 Wendy Carlos is a legendary American synth composer who’s famous for scoring the soundtracks to movies like Tron, The Shining and A Clockwork Orange. She was born Walter Carlos, and her transition was especially commendable at the time because she was the first to compete within the world of movie soundtracks as a trans person. Very little is known about her personal life, and there’s something alluring to being both famous and mysterious. I admire how she was able to create a powerful and eccentric universe of her own design. I first came across her work through the movie soundtrack she contributed to Stanley Kubrick’s A Clockwork Orange. The scene that stood out to me in particular was the popsicle/record store one, in which the main character walks around the vinyl section of the London Chelsea Drug Store to a synth rendition of a classical tune: Beethoven’s Turkish March. There’s something Baroque to her music; to me it’s chamber music of the future. For the Clockwork Orange soundtrack, Carlos was working with producer Rachel Elkind, whose synthesized vocoder voice you can hear in this scene. It’s nice to hear a female voice there. She also worked hard at establishing the synthesizer as an instrument in its own right rather than a novelty or toy, for which cause my bandmate Sean McBride and I have also advocated. Her relationship with renowned synth inventor Bob Moog was pivotal in defining the synth as a revolutionary moment in music, as she oversaw the development of the Moog synthesizer. Her award-winning album Switched-On Bach brought the synthesizer into the canon of music history. She worked a lot with early digital synths, too, such as the Synergy, which is what you’ll see in famous photos of Wendy in her studio with the cats and rugs. I love how cozy her studio looks, and it unconsciously influenced the way I see our studio as half experimental lab and half home. For our new album Topiary in particular, we breathed and lived electronic music by spending day and night in an all-wood Connecticut studio called the Clubhouse; we had our favorite books, our entire synth collection and our dog Roland with us. It was all-immersive and it felt like home, and all that allowed Sean to focus on FM synthesis on this album and push its possibilities. These are the synthetic classical instruments you hear on the songs “Baroque” and “Topiary Part II”, for instance: the horns and strings. Another milestone for Carlos was the harmonic twelve-tone scale. Today, pop songs pretty much follow a standard scale that’s called “equal temperament.” That’s a Western world classic, and we use that. What she did was try to create a more symmetrically pure and modulate-able type of scale. This is the harmonic series or “just intonation” scale. I think it’s fantastic when experiments in the underlying theoretical fabric of music touch you, have an effect on all your senses and disrupt what you’re accustomed to. I can relate to that because we have used a similar effect on this album through a very different process: detuning. You can hear that in how I bend the notes on the strings in the song “Marble” and in Sean’s lead sequence; it sounds unsettling and wobbly in a pleasurable way. In addition to her groundbreaking work with modular synthesis, Wendy Carlos is a solar eclipse photographer. And I appreciate all the more because synths are elemental, like fire, light, the sun and the moon. Xeno & Oaklander’s new album, Topiary, is out now on Ghostly International.